Today marked the official recognition of the Coochiemudlo Island war memorial upgrade, which was jointly funded by Redland City Council and the Queensland Government. Mayor Karen Williams said the enhancements framing the locally-important war memorial were made possible through collaboration between Redland City Council, the State Government and island residents. 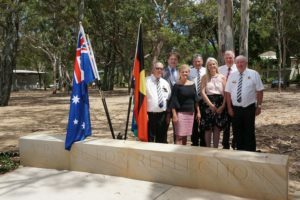 “This project has been designed to ensure Coochiemudlo Island’s war memorial is a beautiful place of reflection for people to remember those who have served our nation,” Cr Williams said. “Works include a new connecting pathway from Coochiemudlo Foreshore Park and a seating area adjacent to the memorial and flag pole, with materials and plants chosen to complement the naturally wonderful landscape of Coochiemudlo Island. Redland City Council invested more than $70,000 towards the project, including $25,000 allocated by Cr Hewlett as part of the Division 4 Capital Infrastructure Program. Coochiemudlo Island Memorial Committee member Graeme Roberts-Thompson, Member for Redlands Kim Richards, Mayor Karen Williams, Redlands RSL president Alan Harcourt and Deputy Mayor Lance Hewlett at the Coochiemudlo Island war memorial. Cr Hewlett said community input had been crucial to its success. 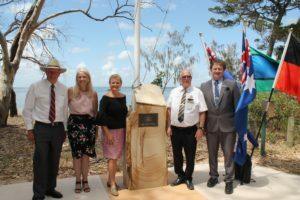 “Coochiemudlo Island residents have a strong tradition of honouring our servicemen and women at commemorations, and it is wonderful this improved war memorial is now available for these special events,” Cr Hewlett said. “Support and feedback from the Coochiemudlo Island Heritage Society, Coastcare Coochiemudlo Island and Doug Cope of the Coochiemudlo Island Memorial Events Committee and RSL were key to the successful grant application. Chair of the Queensland Advisory Committee for the Commemoration of the Anzac Centenary, Captain Andrew Craig, wrote a letter of support that was read at the gathering to celebrate the official occasion. “More than 57,700 Queenslanders served in the First World War, some making the ultimate sacrifice,” he wrote. Redlands RSL president Alan Harcourt, Deputy Mayor Lance Hewlett, Mayor Karen Williams, Redlands RSL vice-president Ian Gray, Member for Redlands Kim Richards, Coochiemudlo Island Memorial Committee member Graeme Roberts-Thompson and Redlands RSL secretary Michael McDonnell at the Coochiemudlo Island Reflection Space.